The standout machine is a new model of the OPTIPLEX 3015 6kW DDL (Direct Diode Laser), a high-speed and high-accuracy machine that offers laser users a step-change in cutting performance. The OPTIPLEX 3015 is equipped with a powerful 6kW DDL resonator, ideal for cutting medium and thick sheet metal. The resonator, the most advanced of its kind, enables fast-cutting of stainless steel and aluminium and is up to 15 per cent faster than its 6kW Fibre equivalent. This highly efficient machine is also available as part of the OPTIPLEX 4020 series. Most importantly, the new DDL machine delivers stable cutting for both thin and thick material, due to the use of Beam Diameter Control, along with Intelligent Monitoring Functions (IMF) and Intelligent Set-up functions (ISF) - all of which combine to produce unsurpassed productivity of circa 15 per cent compared to 4kW machines. In addition, the DDL delivers the highest levels of cutting quality, particularly with thick mild steel, utilising its large cutting sweet-spot to deliver a smooth cut edge. The DDL is equipped with a multi-control torch and new MAZATROL PreviewG. Alongside the DDL will be the new FG-220 DDL 4kW, a new Direct Diode Laser version of the company’s highly popular tube and pipe cutting machines. The new machine is designed for maximum productivity utilising high-speed approach piercing to improve cutting speeds on both thin and medium-thick material by up to 20 per cent compared to CO2 lasers. The new FG-220 DDL is able to cut highly reflective material, such as copper and brass and is ideal for cutting long structural material, including round, square and rectangular pipe, along with H, I and L beams. Also, on the stand will be 10kW and 8kW versions of the OPTIPLEX FIBER III lasers. 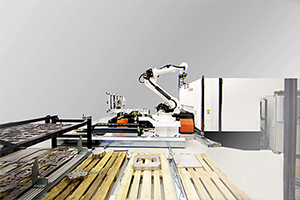 Specifically, the 8kW version is equipped with a Mazak Smart Cell automation system, developed to compliment machines in the Mazak laser portfolio. The Smart Cell system has a small footprint and compact layout along with an ergonomic design for improved access and ease of operation. The automation cell can be programmed offline and, when in operation, offers detailed reporting of production status and operation, automatic parts separation detection and dynamic kinetics to calculate weight and speed. Most importantly, Smart Cell offers an Industry 4.0 ready solution for laser users and has an open interface to aid further expansion, along with an option for a robot solution. The final machine on the stand will be a 6kW OPTIPLEX NEXUS 3015 FIBER, equipped with a Fasani CST automation system. The 3015 FIBER is equipped to deliver higher productivity when cutting stainless steel and aluminium, and is also capable of thicker mild steel nitrogen cutting. The machine is equipped with a range of monitoring and control functions that improve productivity and cut quality, including stable beam cutting from thin-to-thick with beam diameter control; optimised cutting with the Intelligent Monitoring Function and reduced set-up times with the Intelligent Set-up functions. The machine is equipped with a CST automation system, which consists of a single tower mounted above the laser bench, with a maximum of 13 separate drawers for the loading of raw material and the unloading of processed workpieces. The automation system uses a suction system to load and unload workpieces with a maximum load capacity of 3,000kg per drawer. For more information on Mazak’s range of laser cutting machines, please visit: https://www.mazakeu.dk/euroblech.